A masterclass around Chocolates can be very enriching. I had no clue until I attended one recently. 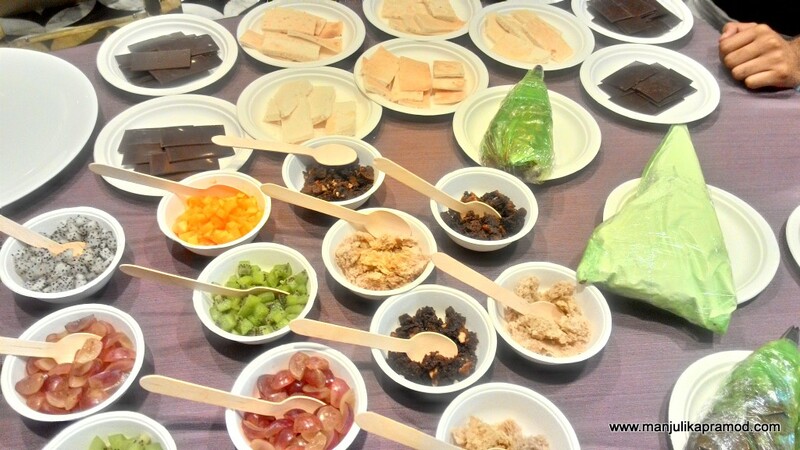 Trust me, after the class, I am able to appreciate the cacao products in a better way. I have learned to decode different varieties and their flavors and textures. I have picked up some interesting vocabulary of the world of chocolates. And most importantly, the joys of indulging in chocolates has increased manifolds. 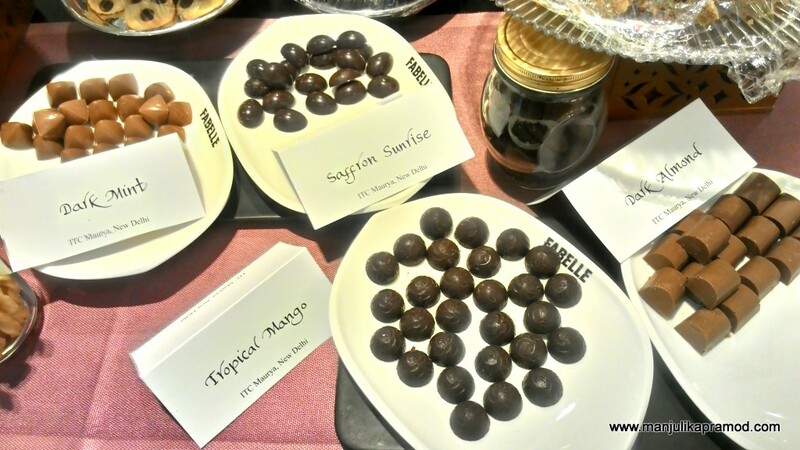 I am glad that ITC Maurya Hotel and Fabelle Chocolate Boutique invited me for a chocolaty session and made this year’s World Chocolates Day (7th July) memorable in many ways. It kick-started with the most informative session, chocolate tasting. 8 kinds of chocolates from different regions were carefully placed before us on the table and we were taken through a tasting session one by one. The basics on chocolates, cocoa mass, cocoa butter and all that goes into procuring it from cacao trees cleared the air around the irresistible sweet-treats. We were also told about the’pairing partners’, as to what goes along best with chocolates. Jasmine tea and coffee shots for sure. I always knew about coffee and wine, but jasmine tea was a new discovery. I picked up some new and useful vocabulary too. 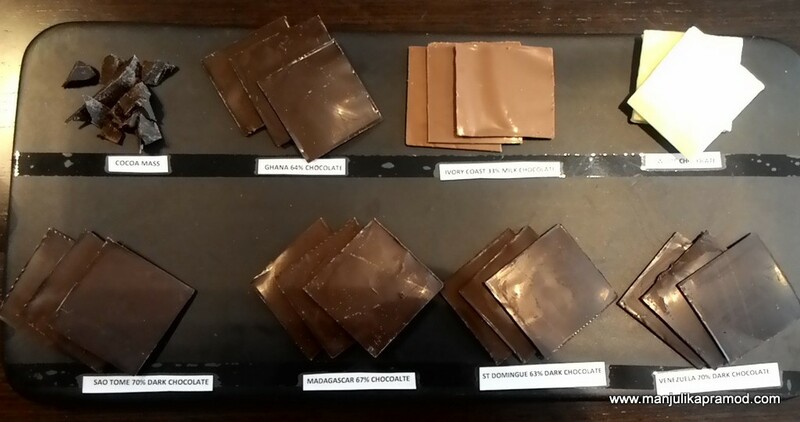 I am gonna tell you about Couverture, Single origin and Compound chocolates below. Two very important tips were shared by Chef – Firstly, never eat a chocolate directly from the fridge and second never bite a chocolate. Let it melt in the mouth. After the tasting sessions and the tutorials, we learned the method of tempering, an essential step for making smooth, glossy, evenly colored coating for all those chocolates that we eat. 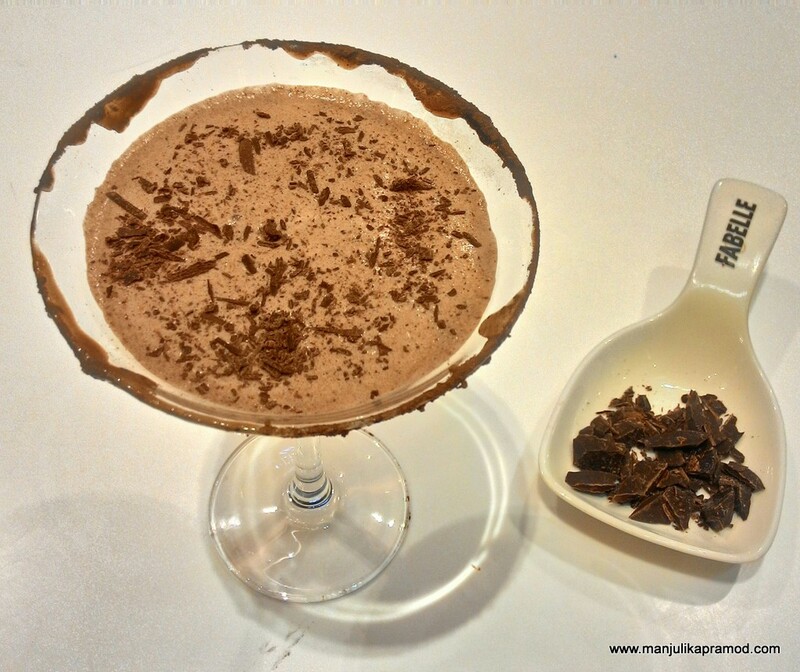 What followed next was about churning some delicious Mocktails using chocolates. The chef from Tian taught 3 interesting recipes and they all turned out to be super yum. The Lunch at Pavillion at ITC Maurya is always refreshing and gastronomically delighting. The dessert section was rocking with amazing creations by Fabelle. 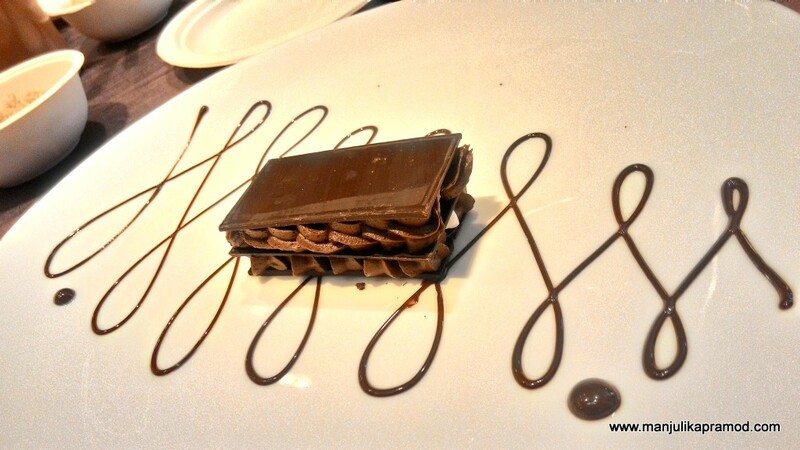 After a sumptuous lunch, we got back to the class and did some interesting chocolate plating. 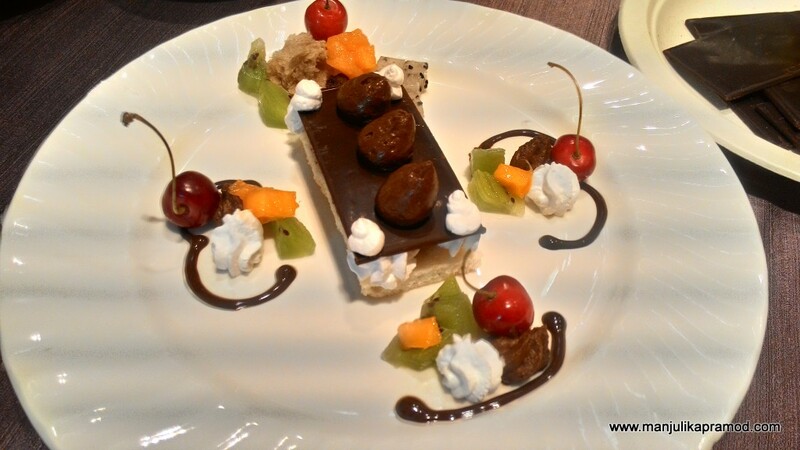 It was like discovering a new form of art with mousse, whipped cream, Ganache, breads and fruits. This was my favorite activity of the day. And last but not the least, the high tea was followed by mini cup decorations. The day ended on a very colorful and sweet note. The purest form of chocolates is cocoa mass. Has no added sugar. 33 % is the percentage of cocoa mass. Rest is sugar and milk solids, cocoa butter. Chocolates as a food product is made from fermented and roasted seeds(beans) of the cacao tree. Chocolates taste differently depending upon where cacao is grown, much like wine and differ widely due to factors like terroir, soil, climate and more. The pods or fruits of the cacao tree are cut, opened and scooped for the beans. The these beans are fermented, dried, roasted, hulled. The shells are removed for only nibs are blended to produce various flavors and colors. When these nibs undergo grinding, we get cocoa butter and fine grinding leads to chocolate liquor. 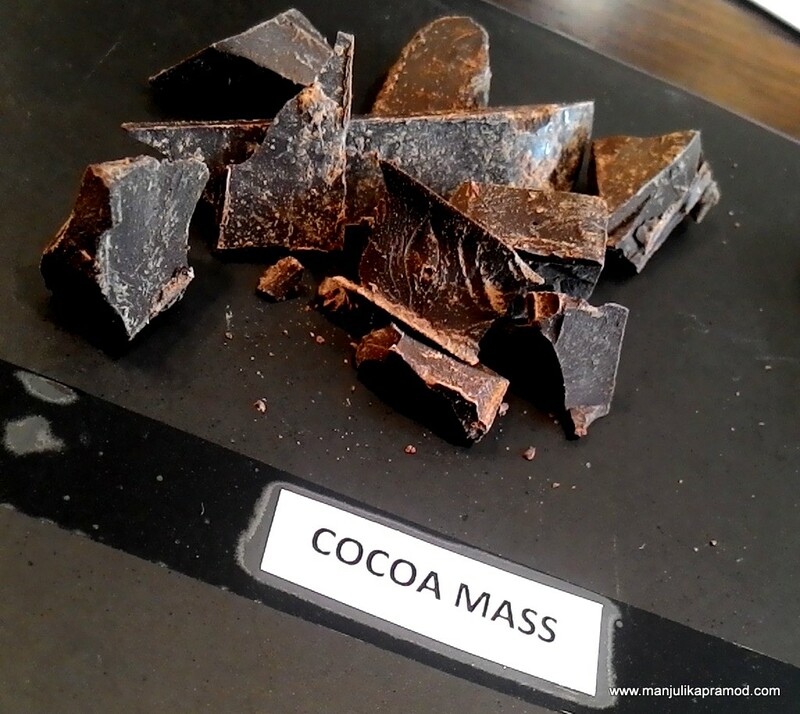 Cocoa mass is raw unprocessed chocolate. It is gritty and grainy. Rolling, kneading and tempering lends the smoother and richer quality. It is very important to ensure that no water goes in the chocolate mixture. The % signifies the amount of cocoa mass in the chocolate variety. 64% Ghana chocolate means it has 64 percent cocoa mass and remaining is sugar and other solids. 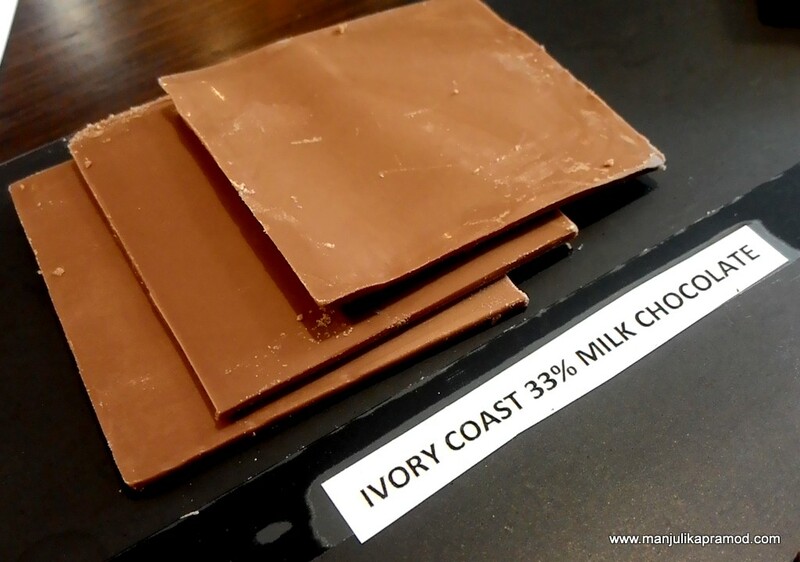 33 % Ivory Coast means 33 % of cocoa. White chocolate is made from combining sweetened cocoa butter, milk solids, sugar, and sometimes vanilla too. A compound chocolate is a blend of sugar, vegetable fat and cocoa powder and dark chocolate is at least 35 percent chocolate liquor and less than 12 percent milk solids while couverture is a good stuff –has lots of dark chocolate with extra cocoa butter. The most raw form is cacao. It is made from un-roasted cacao beans. Cocoa looks the same but it’s not. Cocoa powder is basically raw cacao that’s been roasted at high temperatures. It was really good to learn about different tastes and flavors. Some of them were nutty, some woody, oaky, some fruity. And then the chef explained that each type of chocolate has its own chemical makeup that produces differences in flavor. It is indeed one of the most comforting food and so much can be done with it. Ingredients for making deconstructed chocolate desserts. This is what I created and ate it too. The genesis of chocolates may have occurred almost 3000 years ago. The Spanish wanted cocoa cultivation and the recipe to make a good chocolate drink to remain a secret. Cocoa beans were widely used in barter by Mexican civilizations. Ghana and Ivory Coast may be top cocoa producers, but people there are not fond of it. Cacao beans are divided into three categories- Forastero, Criollo, Trinitario. Madagascar chocolate pairs very well with Jasmine tea.